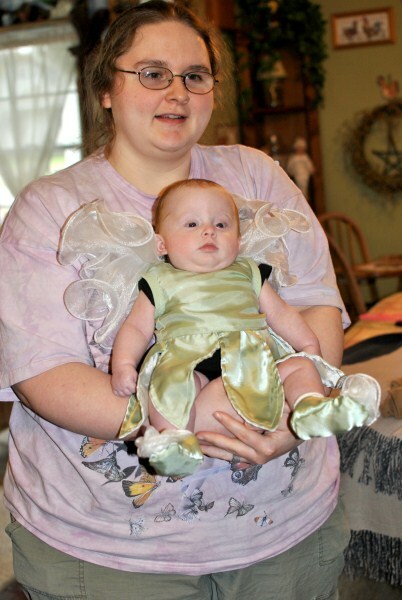 Bouncing Buttons crafts making it simple: Newborn size Tinkerbell costume. I'll start out by writing about the sewing project I just finished (I'm going to pretend I never took a blog break). My brother and SIL had twins (both a girl and a boy)! 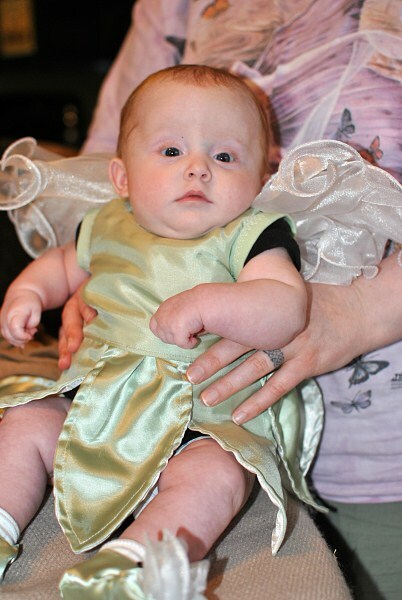 I was SO EXCITED when my family asked me to make a Tinkerbell costume for Halloween! I've never made a tiny newborn costume before. It was so FUN! I didn't spend any money on supplies. To make this outfit I used 2 dresses I bought at the thrift store a few months ago (dresses I didn't have any plans for yet). The body of the dress was made with from a very large, green, dress. I will use the rest of this dress to make more things over the next few months. Please forgive the wrinkles in this dress (I took this picture before I washed and ironed it). The wrinkles are from leaving it in the shopping bag for so long (I often hide thrift finds in the shopping bags under fabric yardage to keep my hubby from asking what I plan to do with it until I find a use for it). Check out the price tag $4.99 and I bought it on 1/2 price day. I paid $2.50 for this dress!!! I'd say the dress size is over a size 20. It's a full length dress made for a tall person (or a girl with very high heals). It is LOTS of fabric for $2.50!!! This dress and trim is all the same fabric. 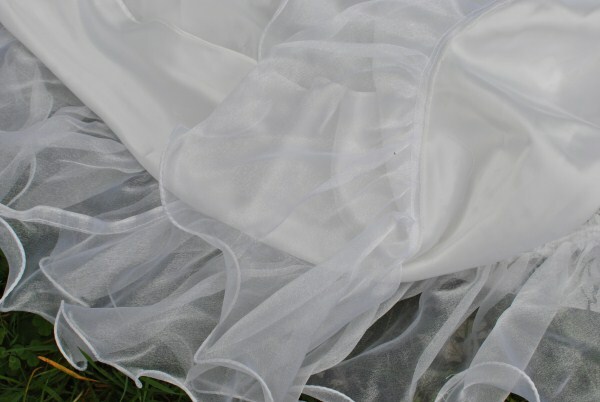 The satin fabric was shiny on one side and dull on the other. To make fairy wings I used part of another dress. 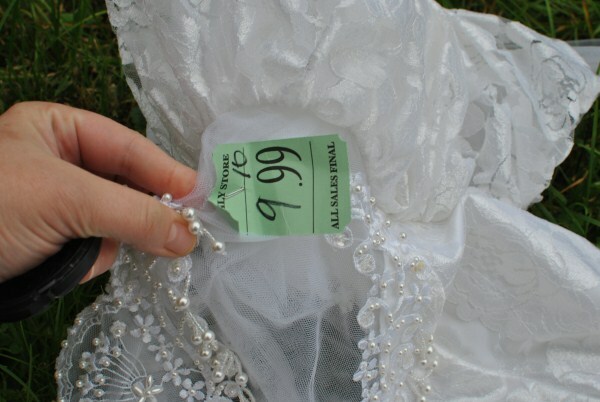 I bought a wedding gown at the thrift shop for $9.99! This gown has a HUGE train! To me it was an awesome deal! I'm sure you will see a lot more of this dress in the next few months. Do you see how crazy long this train is? I can make oodles of child size dresses from the train alone! This dress is wrinkle free because I didn't have to hide it in the bag. 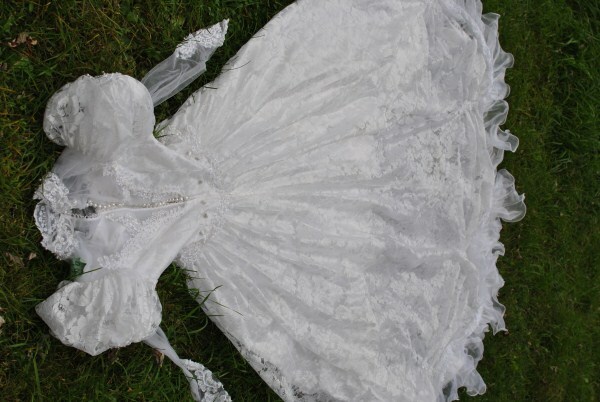 I've been asking my hubby to let me cut up my wedding gown (to make little girl dresses) for years now. 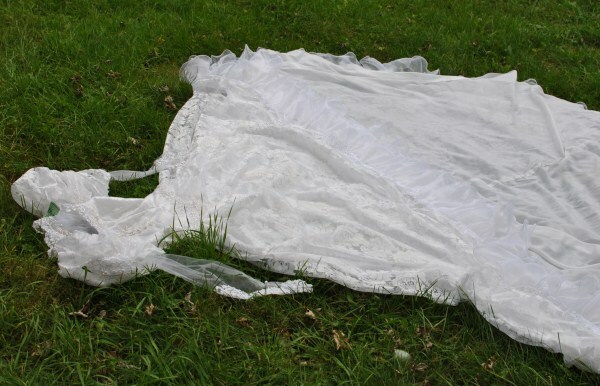 He won't let me (he thinks our marriage will fall apart if I cut into my gown). 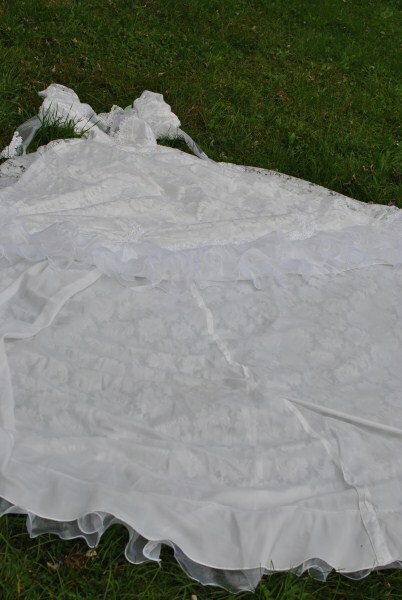 Hubby has known I've wanted to cut up some wedding gowns so I didn't have to hide this large gown I hung this out in the open the day I bought it. What a great deal! $9.99 for so much satin, lace, buttons, beads, ruffles and such. 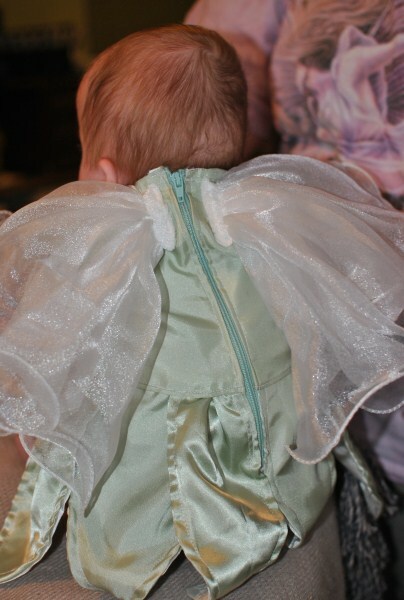 Here is a close up of the ruffles (what I used for fairy wings). This dress has 2 full skirts with a huge train. Both skirts have the ruffles (over $10 worth of ruffles on this dress). In a house with 2 little girls I know I'll use up every yard of ruffles. I sort of made up the pattern as I went along. I made half the skirt shiny and half not (trying to give it more a leafy look). I tried to add petal sleeves but they were so tiny I got tired of fussing with them so I bound the arm holes with some matching FOE I had on hand. 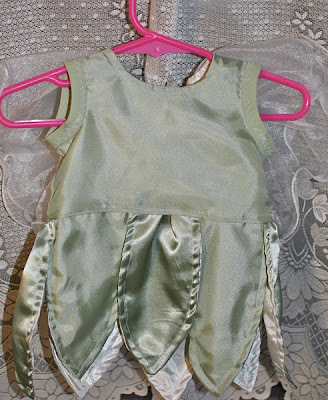 The dress is fully lined using the lining from the original green gown. To make the wings I just cut off some ruffles from that wedding gown and tacked them on the back. It was such a quick way to make baby wings! To finish the look I made tiny fairy shoes. 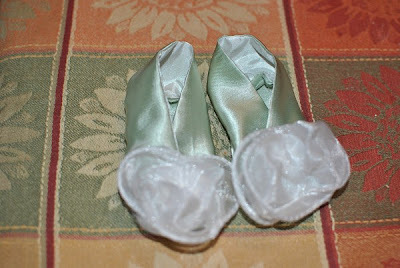 I used a tiny bit more of the wedding dress ruffle to make the puffs on the shoes. I love how her wings turned out. 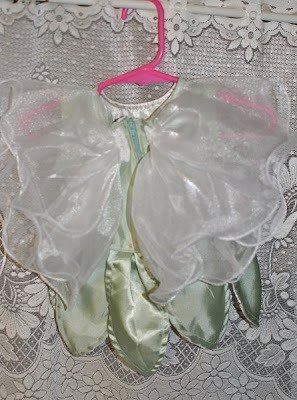 I was worried the standard nylons over coat hanger wings would be an unsafe choice for a newborn baby. Here is one more shot of our sweet little fairy. 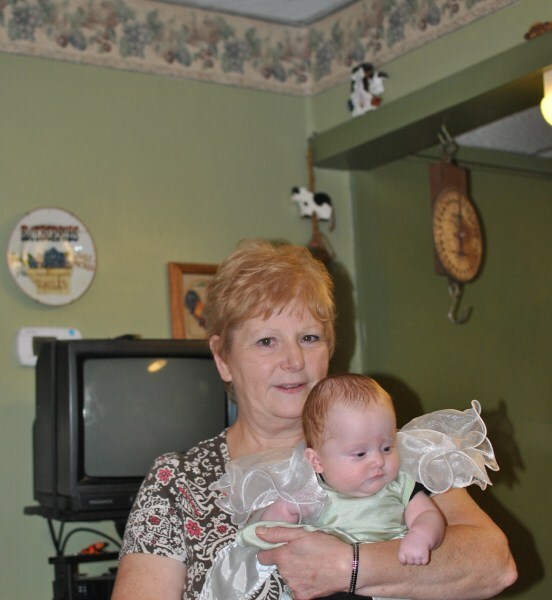 She's in her nana's arms. 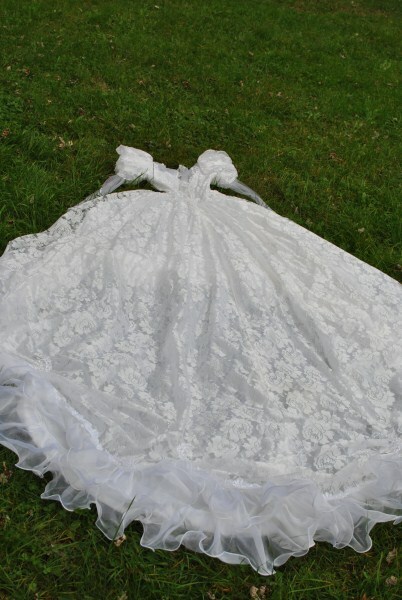 Reason #2 to buy a wedding dress.